They encourage other retailers to also donate the 5 cent fee. 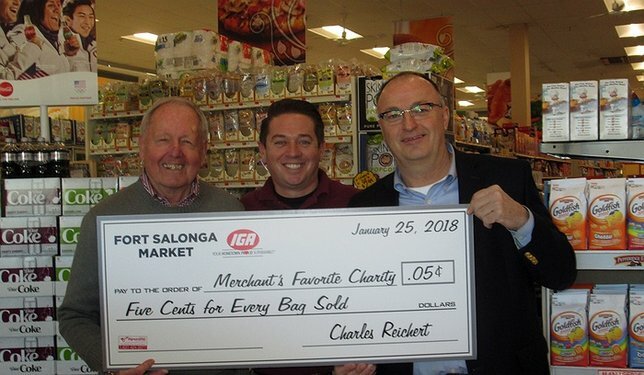 At the Fort Salonga IGA market are from left:Charles Reichert, owner of the IGAs, Ryan Ceriello, Fort Salonga IGA manager, and Suffolk County Legislator Rob Trotta, with a mock check payable to “Merchant’s Favorite Charity,” which was printed by Dawn of Signarama of Huntington Station. Fort Salonga, NY - January 26, 2017 - Suffolk County Legislator Rob Trotta and Charlie Reichert, owner of several Suffolk County IGA markets announced that Mr. Riechert will donate the five cent bag fee from his Fort Salonga and East Northport IGAs to Huntington Hospital. In addition, the bag fee collected at his Greenport and Southold stores will go to Eastern Long Island Hospital in Greenport. “This is a terrific program and I encourage other retailers to donate the five cent bag fee to a local charity or community program,” said Legislator Trotta who represents the district where the Reicherts live and where two of his stores are located. “I have known Charlie and his family for a long time and I applaud him for coming up with this idea as he is known for always giving back to the communities where his stores are located,” added Trotta. “I am reaching out to Shop Rite, Stop& Shop, CVS, Walgreens, Target, Walmart, Ace Hardware and other stores to see it they will support local charities with their bag fee. Furthermore, if a member of the community has a serious illness than a fund like this might help the family,” said Legislator Trotta. “I think businesses can better spend the money than government and I don’t want government officials sticking their hands into this money. I have no faith in the way county government would spend this money. In my four years as a Legislator, I have seen enough wasteful spending for a lifetime,” stated Trotta. Legislator Trotta and Charlie Reichert hope that other retailers will join in this endeavor and support their local charities and/or institutions. Legislator Robert Trotta represents the 13th Legislative District. Legislator Trotta serves on the Legislature’s Economic Development, Parks & Recreation and Veterans Committees. Subject: LongIsland.com - Your Name sent you Article details of "Suffolk Legislator Rob Trotta, Suffolk IGA Market Owner Announce Donation of Five Cent Bag Fee to Local Hospitals"